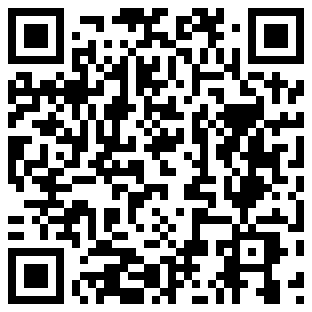 The Binary Clock application has been updated to version 2.1 in BlackBerry AppWorld. This update adds the option to place the clock in a 12 hour mode instead of the default 24 hour mode. You can also now turn off the screen while the phone is charging, by using the lock screen button. 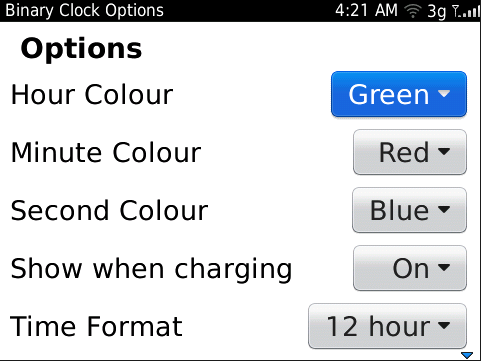 To be able to set the clock to display while the phone is charging you will need to make a $0.99 in-app purchase. 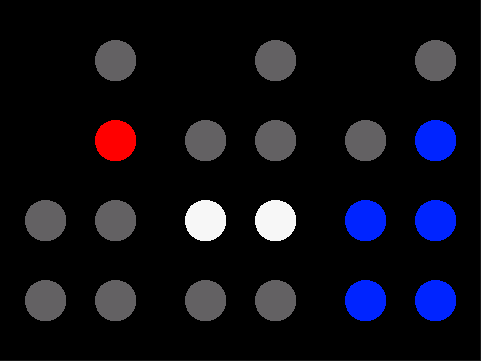 A binary coded decimal can be read with each column added up with each light worth (from top to bottom) 8, 4, 2, and 1, and the column on the left being worth 40, 20, and 10. This is done with each set, which (from left to right) are for hours, minutes, and seconds. For example, the clock to the right shows a time of 4 hours, 22 minutes, and 37 seconds. For more information on reading Binary Coded Decimals see Wikipedia.